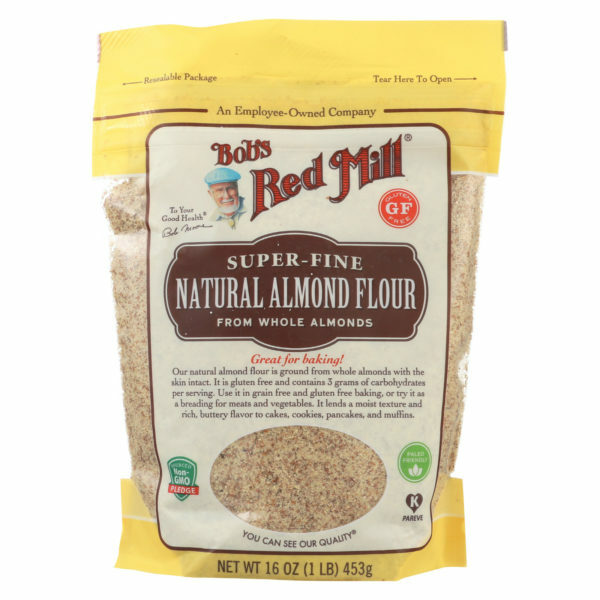 Bob’s Red Mill Almond flour – Our Natural Almond Flour is ground from whole almonds, skins and all. Perfect for paleo and gluten free, grain free baking and cooking, this almond meal’s super fine texture and nutty flavor produces superior cakes, pie crusts, French macarons and other baked goods! Nut flours are more popular than ever these days, thanks to the rise of gluten free and paleo diets. Our almond meal flour starts with raw almonds that are steam pasteurized and then ground into a fine flour that is essential to many French pastries, from the classic frangipane to the ever-popular macarons. Adding almond flour to your favorite recipe will add a wonderful richness. It can even be used in place of graham cracker crumbs for a decadent non-bake pie crust! As a continued commitment to the quality of the products we make and sell, all of Bob’s Red Mill products are certified Kosher by OK Kosher Certification of Brooklyn, New York. All Bob’s Red Mill products are vegetarian. This product is also vegan, meaning it does not include eggs, dairy or honey. All Bob’s Red Mill products are made without the use of bioengineering, using ingredients grown from identity preserved seeds. We are committed to sourcing ingredients that are made without the use of modern biotechnology. For over three decades, Bob has been committed to providing people everywhere with the best quality foods available. His passion for health and belief in taking care of one another is as strong today as it was when he first started the business with his wife, Charlee, all those years ago. Bob plays a fundamental role in the daily operations of the business and his enthusiasm and “honest-to-goodness” approach are shared with every one of his employees. It’s this passion for providing the very best nutritional whole grains that has helped make us the leading name in health foods across the country. Just imagine showing up for work one day as a company employee and leaving as an owner. That dream came true for the employees at Bob’s Red Mill on Bob’s 81st birthday. Rather than receiving gifts, he decided to give his greatest gift away—ownership in his business. Bob surprised all his employees by creating an Employee Stock Ownership Program (ESOP) and making everyone an employee-owner. For those who know Bob, it’s yet another example of his kind-hearted generosity. As Bob puts it “It was just the right thing to do. I have people that have worked with me for over 30 years and each and every one of them deserve this.” You can rest assured that every Bob’s Red Mill employee is committed to sourcing, milling, testing, packaging, labeling and selling the finest products available. After all, it is our business.